One is the captive design of the rotating bezel, which differs greatly from that of conventional snap-in mechanisms. A special design prevents the rotating bezel from becoming detached as the result of catching or being accidentally knocked, causing the set time to be lost. The T1, T2 and U1000 series also features a second element. 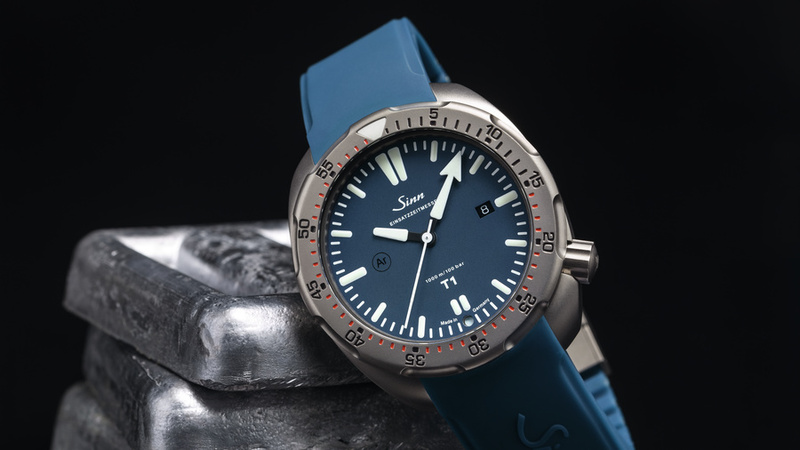 In addition to the captive design of the T1, T2 and U1000's bezel, it is also protected against accidental rotation – a feature which goes beyond the specifications laid down in DIN 8306. 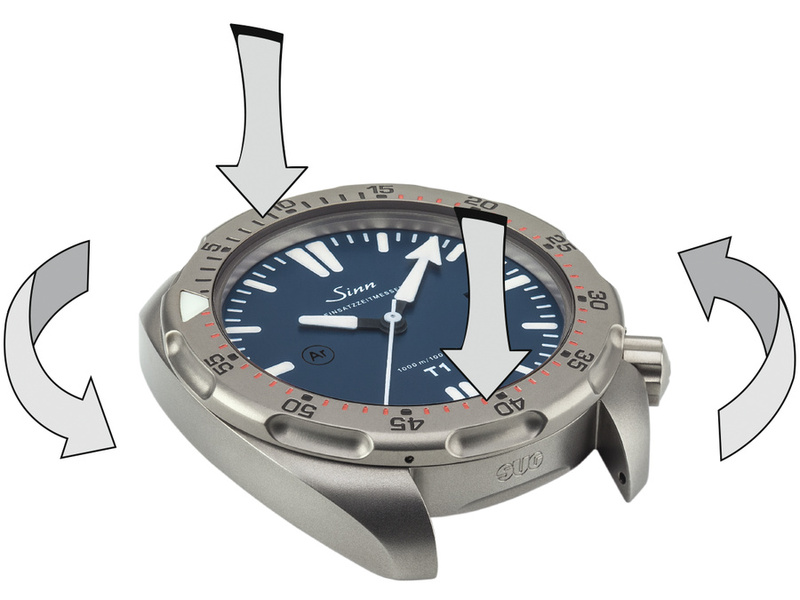 This standard stipulates that it should only be possible to adjust the set time of a diver's watch by turning the bezel anti-clockwise on one side. 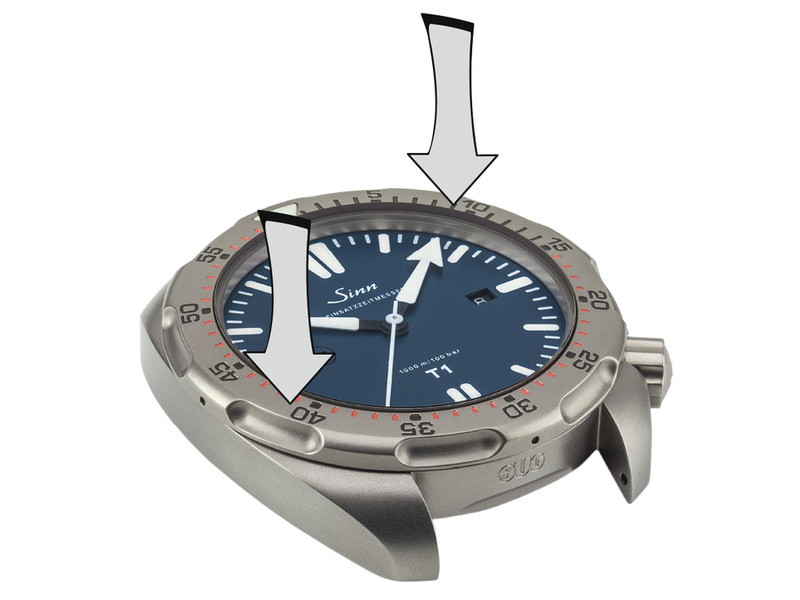 A mechanism prevents the safety bezel of the T1, T2 and U1000 from being unintentionally rotated. This makes it impossible for the set time to be accidentally knocked and changed. 1. To adjust the set time, first unlock the bezel. Press it down on opposite sides using two fingers. It is not possible to unlock the bezel using just one finger. 2. Hold down the bezel and turn it anti-clockwise to the desired set time. Once you release the bezel, the rotation protection is reapplied and the bezel is once again prevented from being accidentally adjusted.